The cutting paper factory and the printing & packaging factory invented a new process to reduce the production cost of the cake paper bag. Normally, cake paper bags make from a big roll of paper, and it always has some paper left from the process. The production cost from the process was so high because it had to include the cost of left over paper. The printing & packaging factory had a financial problem. Then the owner had an idea to reduce the production cost by using left over paper instead of standard paper. This new process decreased the number of left over paper and increased the income in the same time. Coconut milk cake; the tradition dessert of Thailand. From process A, 7.5% of them are useless. 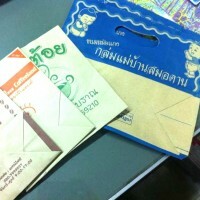 8% of every roll always go to recycle factory but the cutting paper factory proposed to use them for a cake paper bag. The origin of a whole process; 1,000 kg paper. The new process started from the question "How to reduce the production cost of the cake paper bag?" The cutting paper factory came up with the idea of re-using the left over paper from the previous process. To achieve this idea, they had to use human force and small machine which took a lot of energy and time. Firstly, the workers have taken paper off the roll and folded paper in the good way. Secondly, workers have started cutting process by small machine which created custom size papers without any left over later. Then workers have sent all custom papers back to the normal process in the printing and packaging factory. The new process (process C) has increased 2 times profit for the printing & packaging factory and 3 times profit for the cutting paper factory. It proved that it makes more income than the previous and reduces the quantity of waste material in the same time. In addition, re-using the left over paper is a way to create work for young people around the factory. Everyone can create good and cheap design, when they find the value and quality of useless thing.